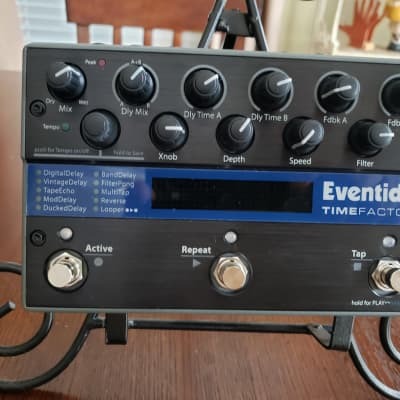 TimeFactor, Delay/Echo/Phrase Sampler for Guitar from Eventide in the Factor series. 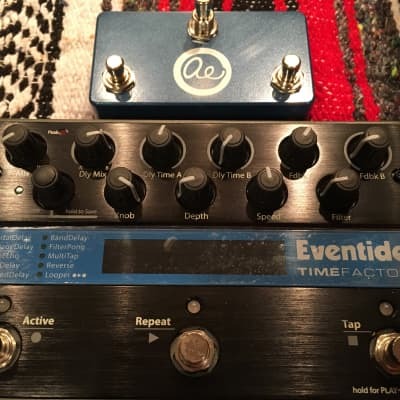 SonicPulverizer's review"Well priced super delay"
The Eventide brand has always made world class effects with inspiring amounts of flexibility in terms of crafting unique sounds. Until the Factor series stompboxes were released, it was hardly attainable as the larger, more powerful rack units offered were thousands of dollars. The TimeFactor is my first experience with the line, and so far I'm significantly impressed with what is offered. The unit features 10 individual time based effects (Digital, Vintage, Tape, Mod, Ducked, Band, Filter Pong, Multitap, Reverse, Looper), 100 factory presets, as well as midi capability. The front panel of the unit sports an impressive number of rotary controls for effects parameters as well as selecting effects to use. Touching on the looks of the pedal, the TimeFactor is very sleek and modern. An expensive looking pedal bound to add flash to your pedalboard. The amount of real time control available through midi support and expression pedal compatibility, coupled with the stereo options in the I/O make this pedal a dream for gigging musicians. The sound quality may be not quite at the level of other boutique manufacturers such as Strymon and JHS, but the amount of presets and the room to create large volumes of instantly recallable patches makes up with quite a competitive edge. The sounds of the TimeFactor are great. The loop feature is very well laid out with the footswitches, allowing you to create nice ambient moments inside a set. A lot of the presets are perfectly useable and make for light work dialing in a sound that fits for a particular part. 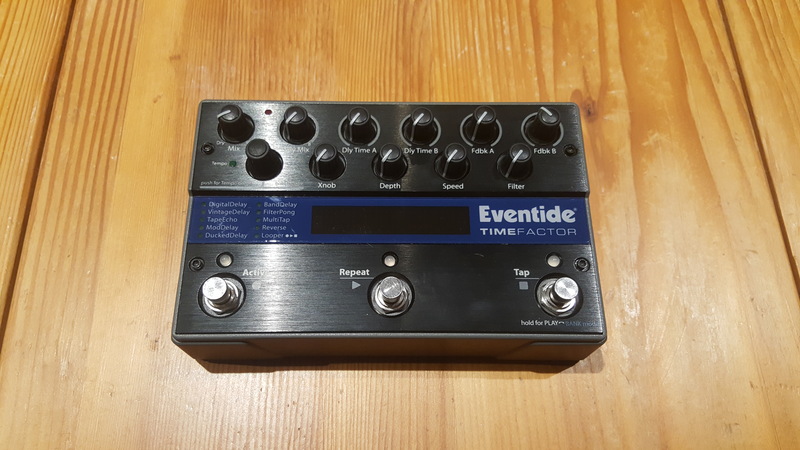 The Eventide TimeFactor is an excellent delay for gigging musicians especially. If you need midi control and enough storage room to fit patches for recall, you will be served well with this pedal. 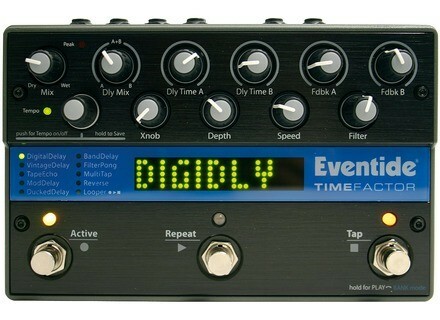 The direct competition to the TimeFactor is the Strymon Timeline. The TimeFactor can be had commonly for around $299 on the used market, while the Strymon is a rare catch altogether in the used market. 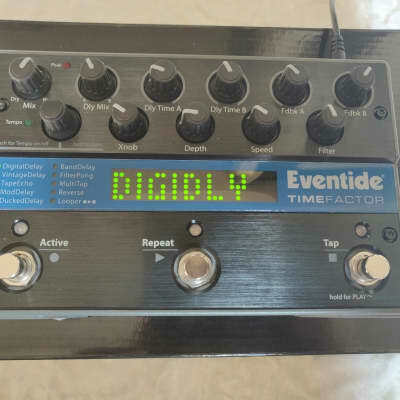 VishNuRoXoUt's review"Favourite digital delay on the market!" 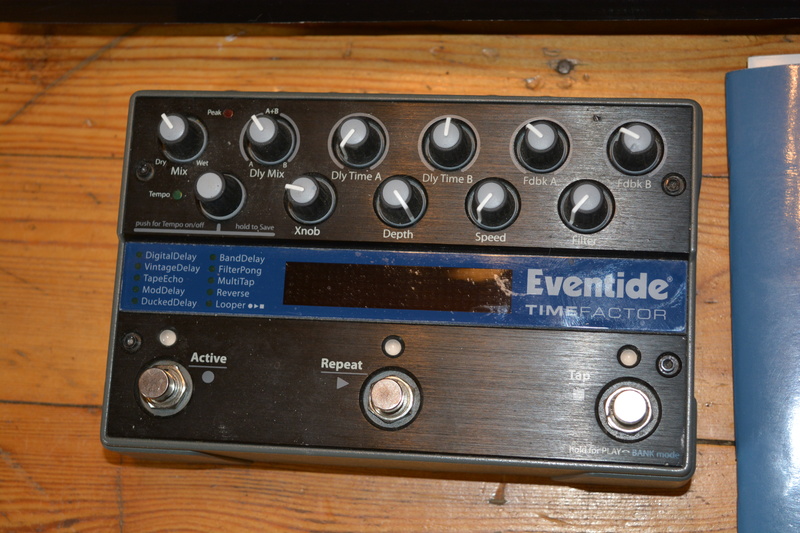 The Eventide Timefactor is a "do-it-all" digital delay unit that is know for it's studio quality delay sounds. It has 10 different delay types including ModDelay, Tape Echo, Ducking Delay, Vintage Delay, Band Delay, Filter Pong, Multitap and reverse. Then has a 12 second looper. The unit has stereo ins and outs with switches for both sides for line level or guitar level. Very convenient. It's many features can be controlled via midi, expression pedal or an auxiliary footswitch. 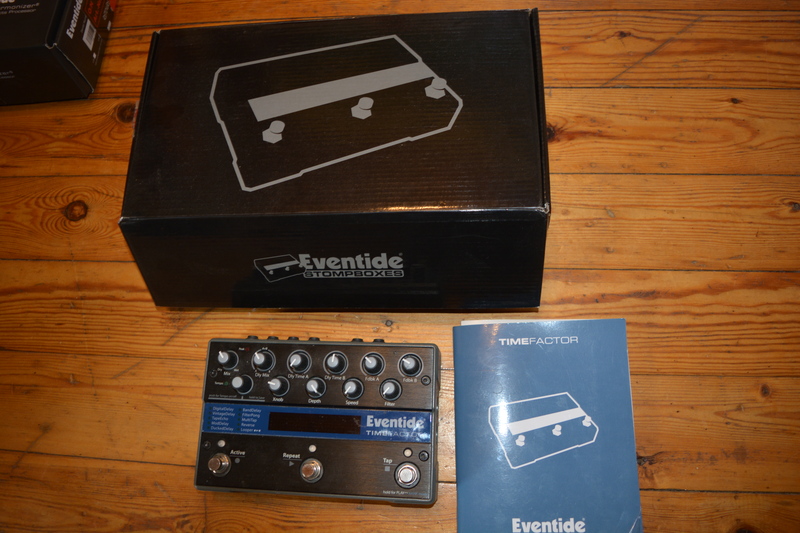 The firmware can be updated via USB and a download from the Eventide site. It's very simple. Everything is solid when it comes to construction. The pedal and the switches feel like a tank to me. 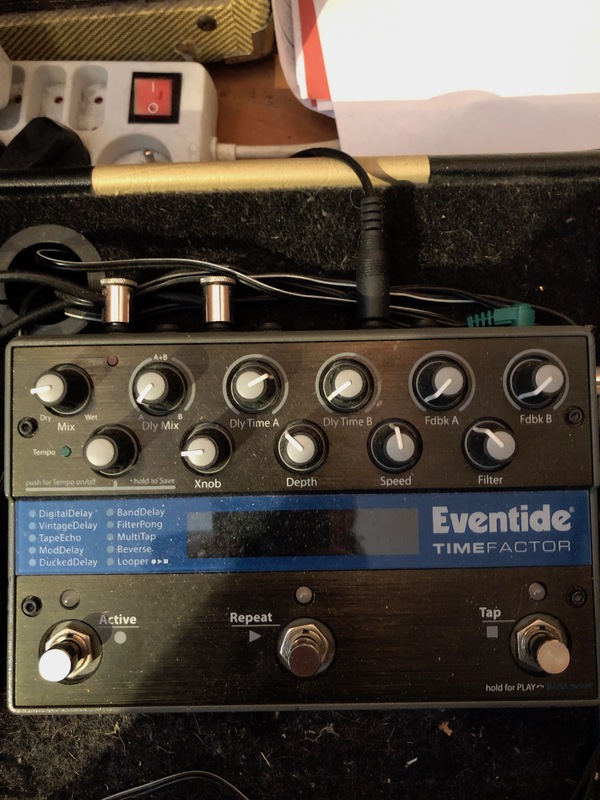 This pedal has a lot going on and can be somewhat overwhelming to someone who is new to Eventide's pedals. But once you understand how to edit the sounds it gets very easy. You can pretty much get any delay sound out of this thing. The 11 knobs control an insane amount of parameters, if you cannot get the sound you're looking for it's probably your fault. The manual goes over each knob and how to edit the presets very clearly. One of the more usable manuals I've used for a pedal. This pedal really opens up with the 3 button auxiliary switch. I would completely recommend getting one if you purchase this unit. I've used my TimeFactor for guitar, keys and vocals. It works wonders on all of them. This pedal is very silent and has true analog bypass. I haven't experienced any popping when I engage any switches. I was very happy about that. More than any other sound I use the modulation delay and the tape echo the most. They can be tweaked down to the tee. I have a very nice Deluxe Memory Man sound on mine, it's very accurate. I also really like the multitap. You can set two delays to numbers in the Fibonacci sequence and get some very very cool sounds with that. There is nothing about this delay unit that I can complain about. It was everything I expected and more and I have had zero issues in the entire time I've had it. I've used the DD-20, DL-4, RE-20 and a few other small digital delays and this thing takes the cake and more. The quality and sound is above par with anything I've used the price is sort of high but it's definitely worth it. I found mine on a forum with a auxiliary switch built by Dan at T1M for only $325 in very great condition. Worth every penny. At a high price, the timefactor comes with a high level of features. Some players might scoff at paying this much for a digital delay, but the features are great on paper. Two delays at once, bank mode, repeat switch, a large library of delays including tape, mod, ducking, reverse, and multitap delay. It's even got a looper. There's not much you can't do with this unit. The editing is quick and easy. The control layout is a great relief to anyone who's used a pedal delay before. Everything is organized well and needs little explanation. On top of that, the timefactor has midi and usb, and stereo functionality. The manual is great. Really. Eventide explains everything you would want to know. I typically use the unit in bank mode. When I'm at home editing presets I just switch to play mode and start twisting knobs. I have used it with a midi controller and that's easy too. I have not used the looper but from reading the manual it seems very functional. The tap feature was a deal maker for me. I love the dotted 8th tap and it's easy to use on the timefactor. I primarily use the vintage and tape delays with a Gretsch Duo Jet and a Vox AC30HW. The modelling for these sounds is spot on, and with Eventide's updates they are even better. The vintage delay responds just as it should, getting muffled as the feedbacks trail off. The tape delay also sound 100% real to me. You can adjust how "old or vintage" you want these effects to sound via the modification knobs, which is a plus. Overall you can get any sort of delay you need. 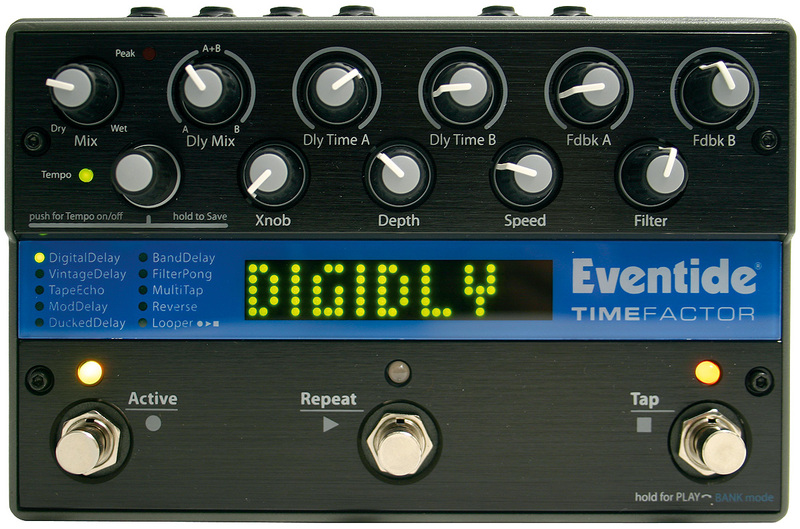 Classic eventide delay sounds can be had or you can get some very ethereal sounds with the reverse and mo delays. As far as functionality and features, this unit kills. I've heard a lot of people say the sound quality isn't quite up to par with a truly analog delay, but I disagree. I think this is a great sounding delay that delivers what it promises. The midi is great to have. This is a chameleon of a delay pedal in that it can fit any player's needs. iamqman's review"One of the best"
I know that many musicians claim that this is the best digital delay units on the market. I wouldn't disagree, but I just couldn't jive with it. For me this unit is in someways over produced. There are so many tweaking capabilities that I found myself playing with this thing more than playing the guitar itself. There is so many options that is got to be too much for me. I like things simple and easy. I don't like things to be too complicated. I like plug in and go. I played this unit with an assortment of rigs. I tried it will my Gibson Les Paul and I tried it with my Fender STratocatser and several different amps and I just couldn't get a tone that I liked. I also found that the volume would drop when I would engage the unit. I had it on the guitar line out puts and inputs and there was a noticeable differ3nce in volume when I clicked this thing on. Perhaps I need to have the output the line level out or whatever it read. Either way it was enough for me to dump it. I'm sure I could have with a little more time figured out how to run this ting properly but I am impatience and it didn't hit me right off the bat. There update via the internet are very easy and I like that capability. 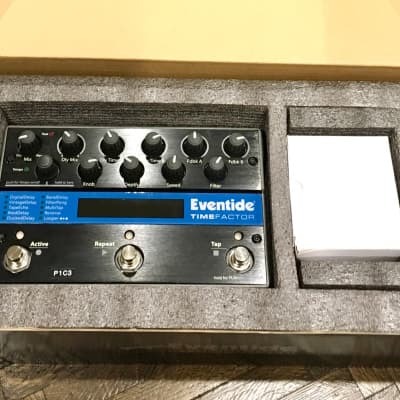 I really like Eventide but my patience in thin and they have so much tweak ability in their products that I would not find pleasing. At new these units come in at around $399. On the used market you can get them under $300. Not a bad price for this unit. It definitely is the best delay out there but too much figuring out for me. I don't use that much effects in my gigging rig anyway so this thing was just overkill for me.